From the Treasure Coast of Florida, this is one of several items of fine jewelry which have recently been placed with us on consignment. They are part of a large, living estate, from Palm Beach, Florida. A number of the pieces of jewelry have already been sold locally, (prior to our photographer even having had the time to formally photograph the items to accompany our online listings). In addition to the items of jewelry, we also have in our possession copies of a multi-page appraisal covering each of those items, and have included relevant excerpts from the appraisals as part of the description which appears below. The appraisals were prepared by a G. I.A. accredited Appraiser/Gemologist, whose offices are located in Palm Beach, Florida. The dates appearing on the appraisals are January 17 and January 18, 2005. Described in appraisal dated January 18, 2005 as "Ladies 14k yellow gold diamond pave' heart .....the heart contains 70 round brilliant cut diamonds being 3.00 G-H in color and VS1-SI1 in clarity. All the diamonds are matched". The consignor preferred white gold so she purchased a 14k white gold chain and replaced the original yellow chain. She then had the yellow gold portion of the heart rhodiumed to match. 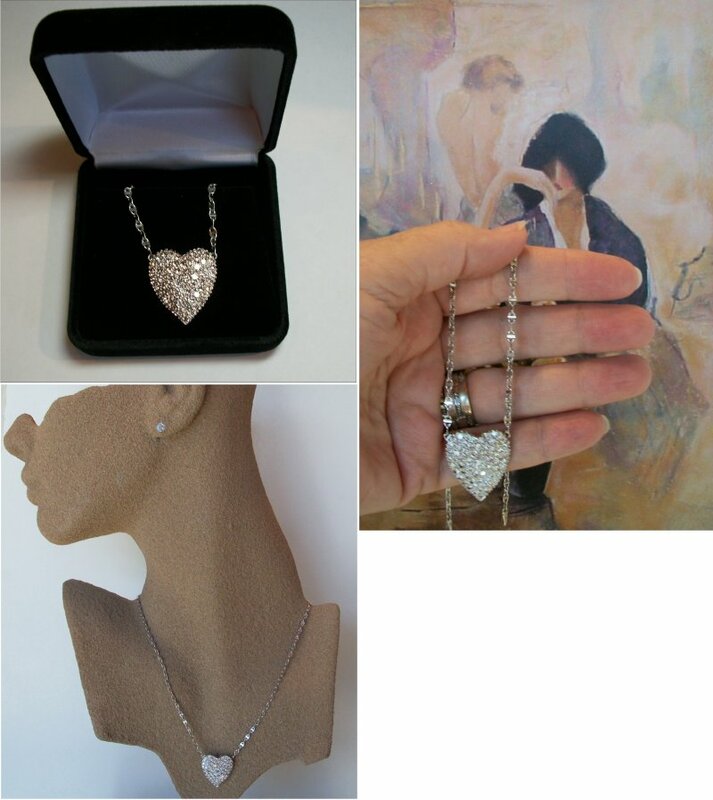 The result is an elegant and tasteful pave' diamond heart on a 16" chain. The necklace weight is 6.40 DWT. The heart measures 24mm. It appraised in 2005 for $5000. Please DO read the section below entitled A WORD ABOUT OUR PRICING. Layaway Is Available By Request. Pay close attention to items marked FANTASTIC BUY! . Display ALL rings or select from categories displayed below. 1, Diamonds, all shapes, all shades. 9, Gold without gemstones, from simple bands to richly ornate rings.